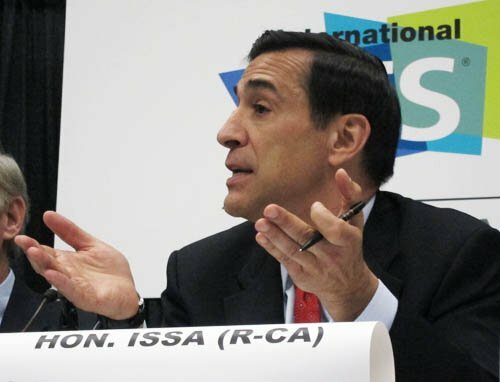 Republican congressman Darrell Issa of California has published the full text of the Anti-Counterfeiting Trade Agreement (ACTA), saying that the public has a right to know what their governments have been hiding from them. "ACTA represents as great a threat to an open Internet as SOPA and PIPA and was drafted with even less transparency and input from digital citizens," Issa said in a statement. "This agreement was negotiated in secret and many of its vague provisions would clearly increase economic uncertainty, while imposing onerous new regulations on job creators, internet service providers, innovators and individual Americans." Issa has now invited members of the public and interested parties to study the terms of the deal and make suggestions. This kind of open system had worked well with Issa's Online Protection and Enforcement of Digital Trade (OPEN Act), which is currently being considered as an alternative to the widely reviled SOPA and PIPA legislation. The move comes after Europe's Justice Commissioner Viviane Reding has asked the European Court of Justice to check the fine print on the contract before the European Parliament votes on it this summer. Several countries are holding off on ACTA ratification until that vote, and if the Parliament rejects it, ACTA will fail. Negotiations on ACTA started under President Bush the Younger, and have been carried on by the current administration. Due to some legal fine print, the agreement isn't under review by elected officials in the US, whose government refuses to classify ACTA as a formal treaty, and insists that as such it doesn't have to go before Congress for ratification. Issa points out that the current US vice president, Joe Biden, was very vocal on the need for democratic oversight of overseas agreements, penning a letter to then-president George W. Bush on the topic in 2002.